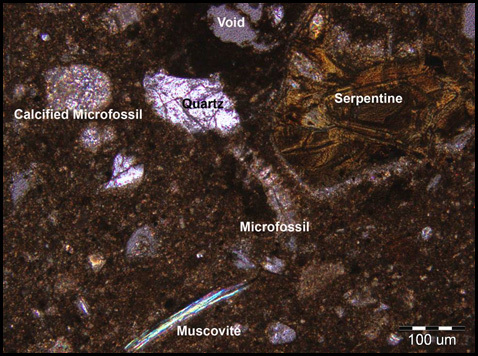 Petrographic and compositional analysis of ceramics can provide researchers with useful information. The Durham University team, under Graham Philip and postdoctoral fellow Kamal Badreshany will examine ceramics collected during the Homs Regional Survey with optical microscopy and a scanning electron microscope fitted with an energy dispersive spectrometer (SEM-EDS). The University of British Columbia team, under Lisa Cooper and postdoctoral fellow Lynn Welton will examine the ceramics collected from Tayinat and the Amuq Valley and the Ghab region around Tell Acharneh with optical microscopy. The goal is to identify the properties of materials used and the technologies employed in the manufacture of ceramics in order to track long-term changes in production, consumption and distribution, and better understand the social and economic implications. Bulk chemical analyses with Electron Dispersive X-ray Fluorescence Spectrometry (EDXRF) complemented and reinforced the petrographic analysis. Samples will also be analyzed by Inductively Coupled Plasma Mass Spectrometry (ICP-MS). Photomicrograph of Iron Age Pottery from the Tell Tayinat. Initial results from the Homs region show that Neolithic populations living across the survey area adopted a diverse range of traditions, and used highly variable materials – attesting to the widespread and rapid adoption of pottery technology in the region shortly after its introduction. The petrographic analysis of Early Bronze Age ceramics from Tell Tayinat suggests that the inhabitants of the site had developed advanced technological skills in pottery production. They carefully selected materials that were appropriate for particular wares and vessel types, and used distinctive production sequences to achieve particular desired characteristics and appearances for different kinds of vessels.